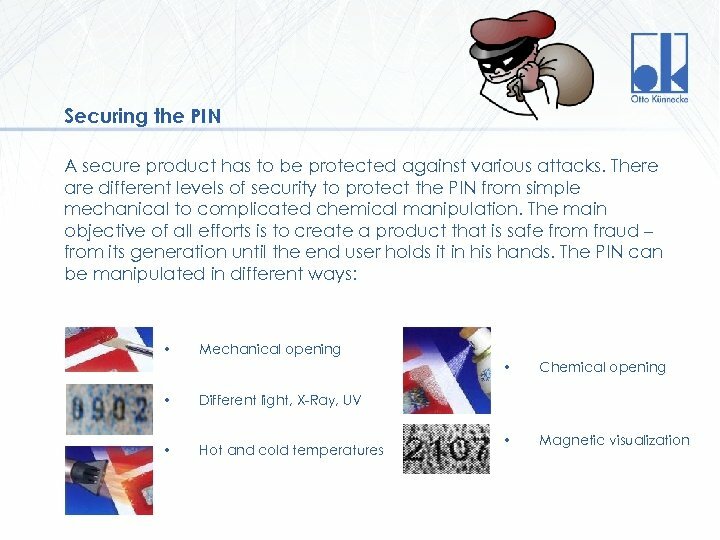 Attack methods What is a PIN? 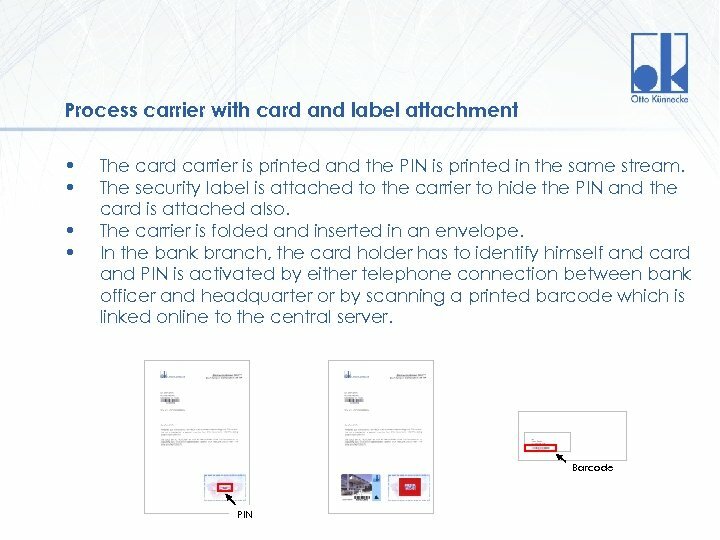 Personal Identification Number What is a PIN mailer? 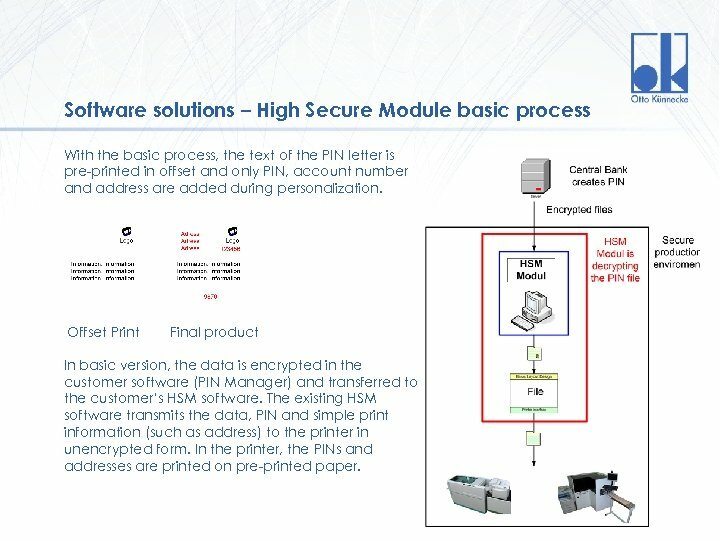 Paper device (stationery on which the PIN is printed) used to advise a user of technology of the PIN. 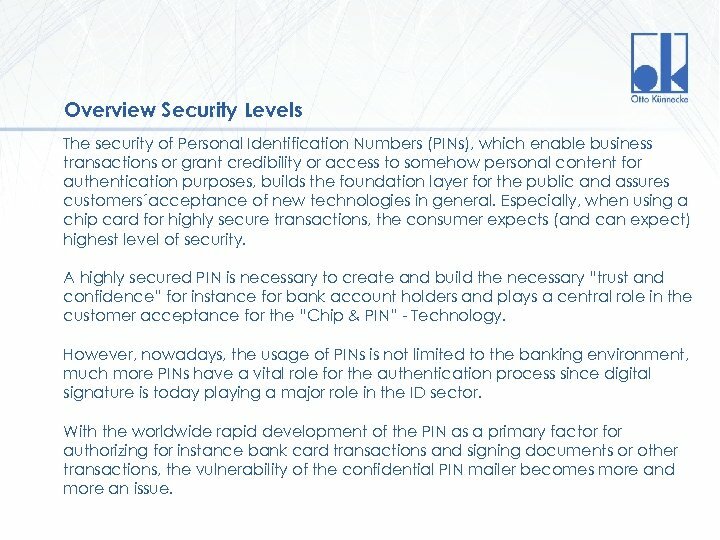 A PIN can be used with a specific bank card. 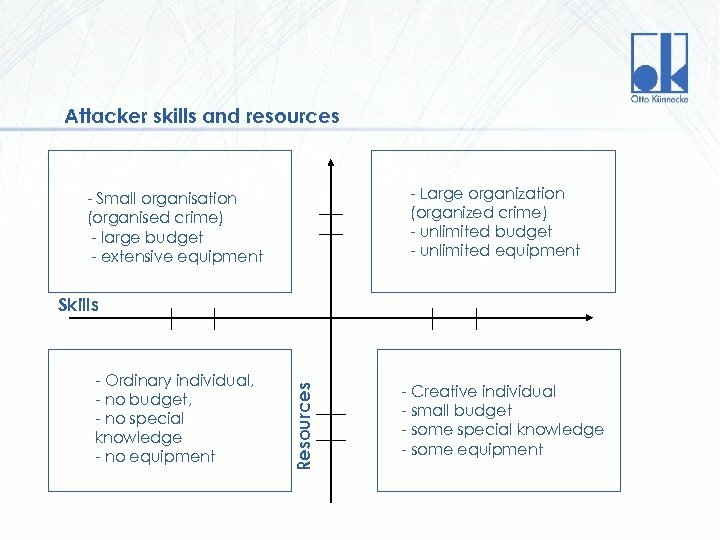 What types of attacks are used by criminals? 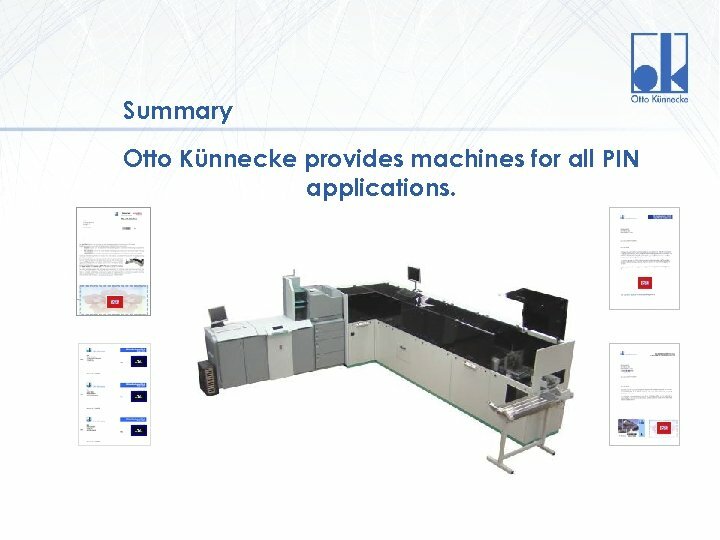 • Optical: image detection using visual techniques including microscopy, different illumination sources, scanning, image filtering, etc. 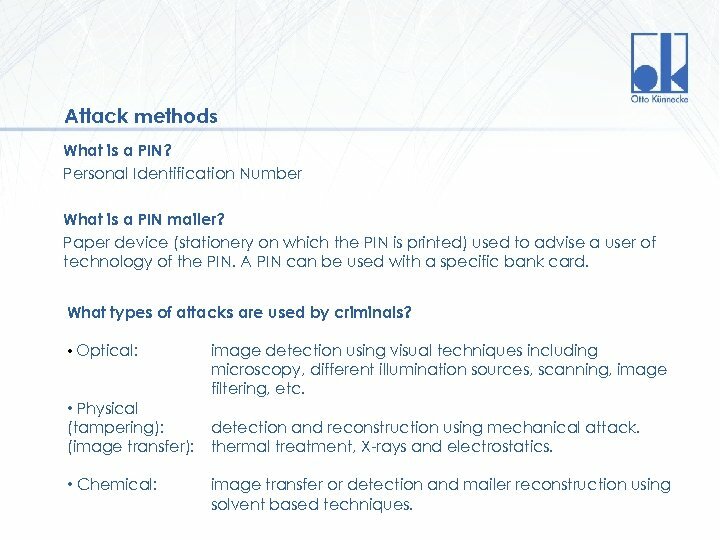 • Physical (tampering): detection and reconstruction using mechanical attack. 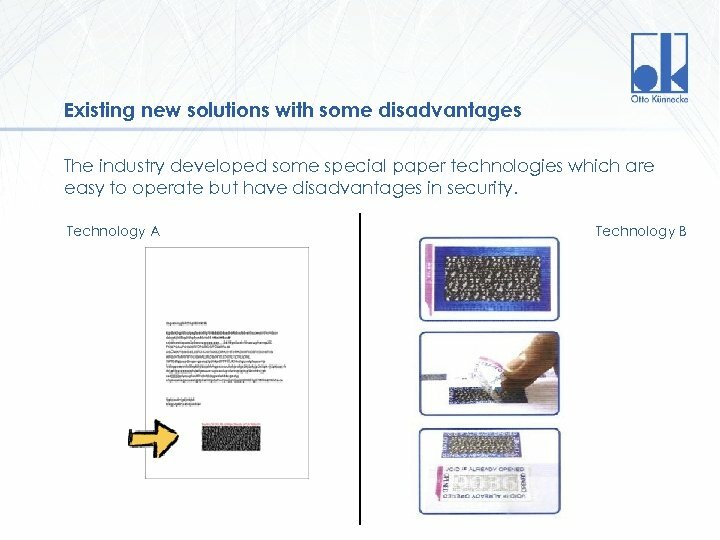 (image transfer): thermal treatment, X-rays and electrostatics. • Chemical: Version 1. 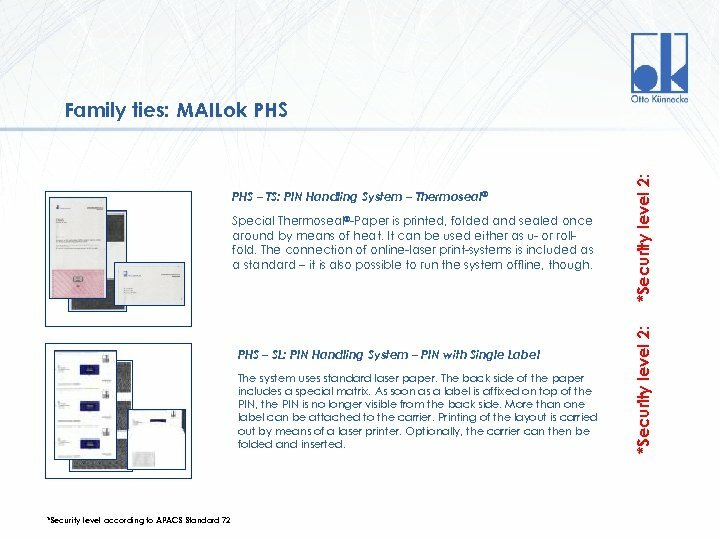 0 image transfer or detection and mailer reconstruction using solvent based techniques. 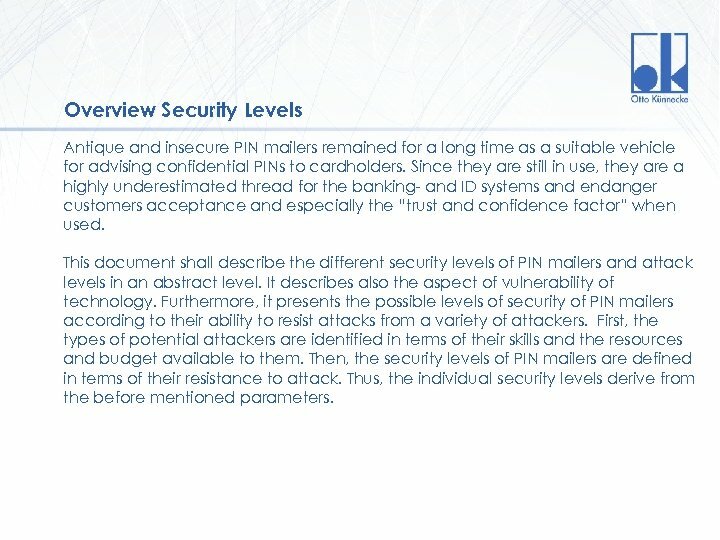 PIN-mailer Security Level Tamper resistance The mailer has a basic level of security and tamper resistance. 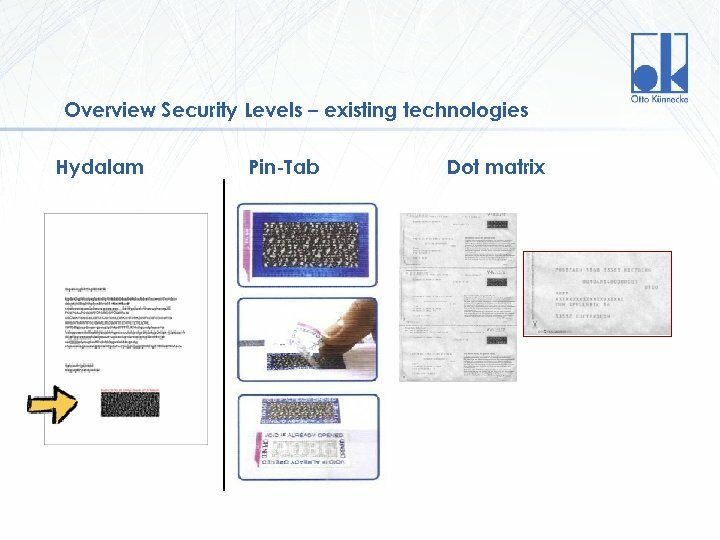 The data it contains could be partly or fully obtained by detailed observation without using any aids to observation Version 1. 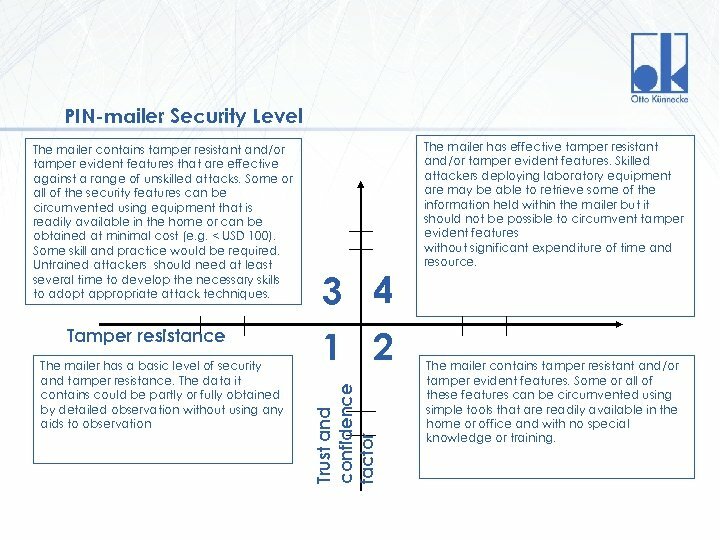 0 3 4 1 2 Trust and confidence factor The mailer contains tamper resistant and/or tamper evident features that are effective against a range of unskilled attacks. 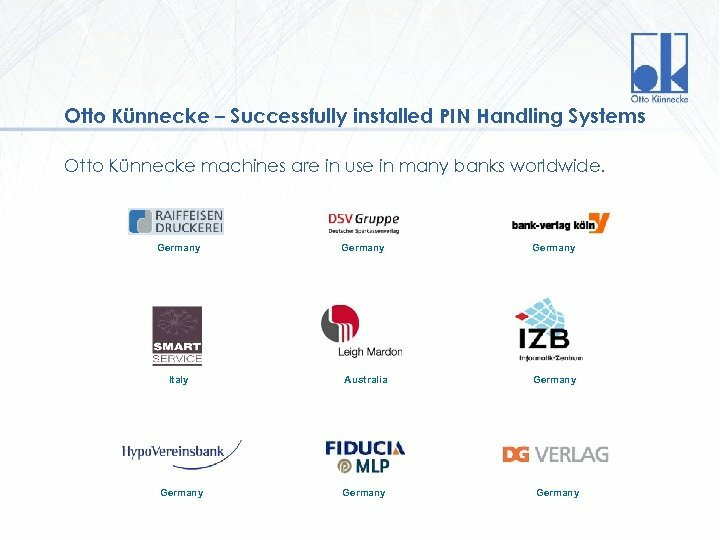 Some or all of the security features can be circumvented using equipment that is readily available in the home or can be obtained at minimal cost (e. g. < USD 100). Some skill and practice would be required. Untrained attackers should need at least several time to develop the necessary skills to adopt appropriate attack techniques. 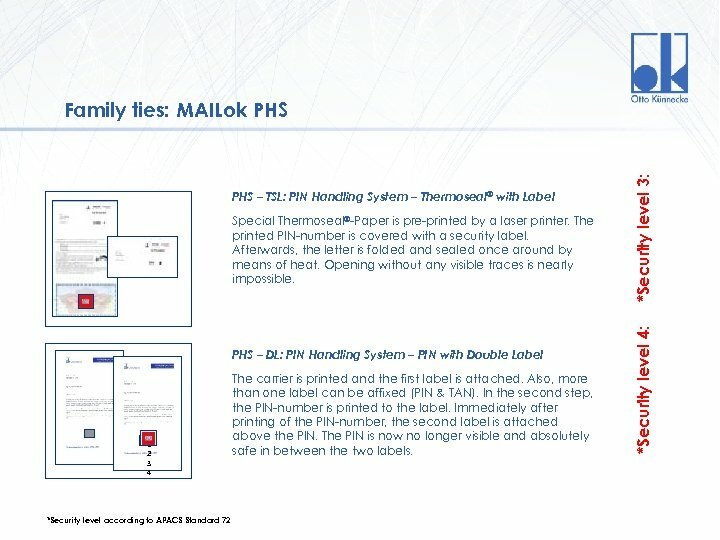 The mailer has effective tamper resistant and/or tamper evident features. 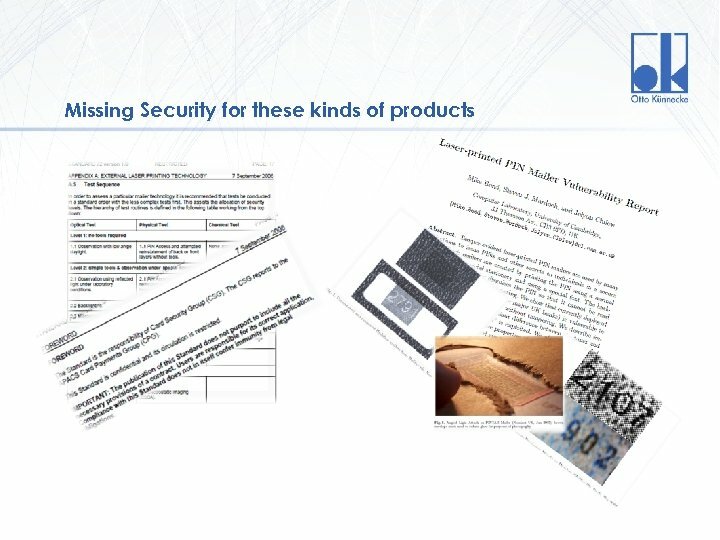 Skilled attackers deploying laboratory equipment are may be able to retrieve some of the information held within the mailer but it should not be possible to circumvent tamper evident features without significant expenditure of time and resource. 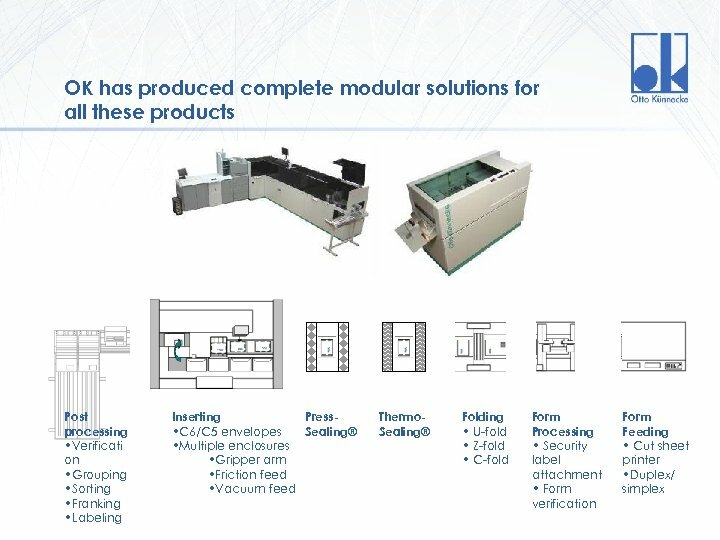 The mailer contains tamper resistant and/or tamper evident features. 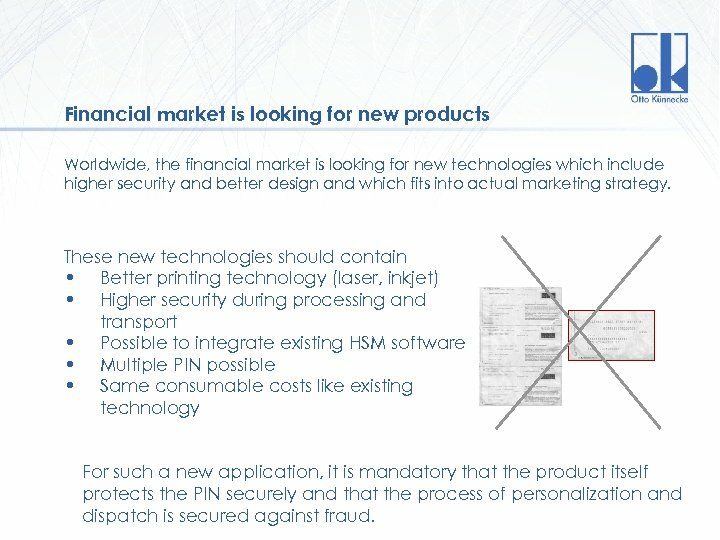 Some or all of these features can be circumvented using simple tools that are readily available in the home or office and with no special knowledge or training. 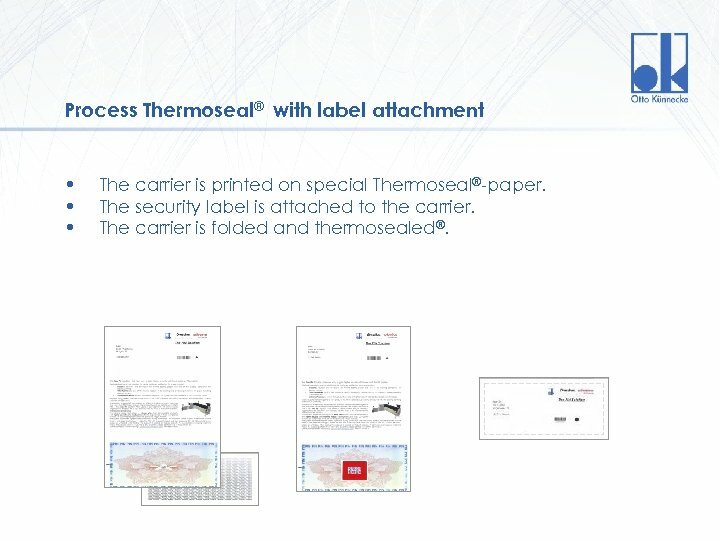 Process Thermoseal® Special paper is required. Version 1. 0 Thermo sealing is an option for PIN letters which is similar to press sealing. 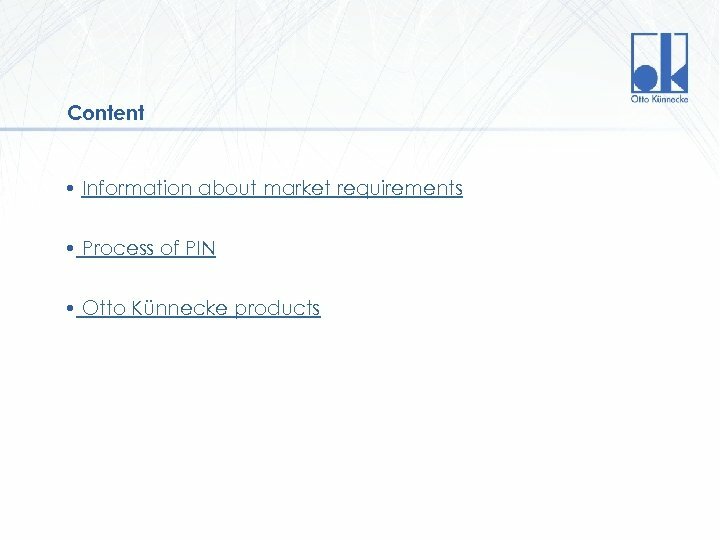 Special paper is required which already contains a special kind of glue on the whole inside of the paper structure. 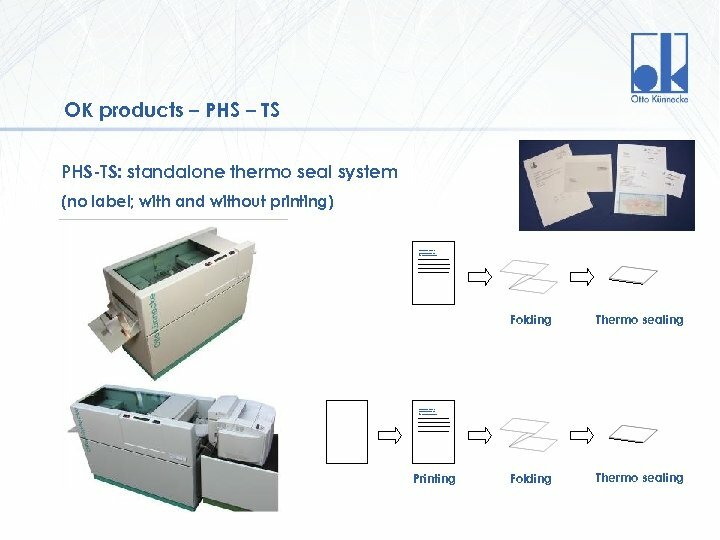 In difference to press sealing paper, combining of the paper can be carried out at any position by means of heated rolls. In this case, these parts of the paper are glued together securely. 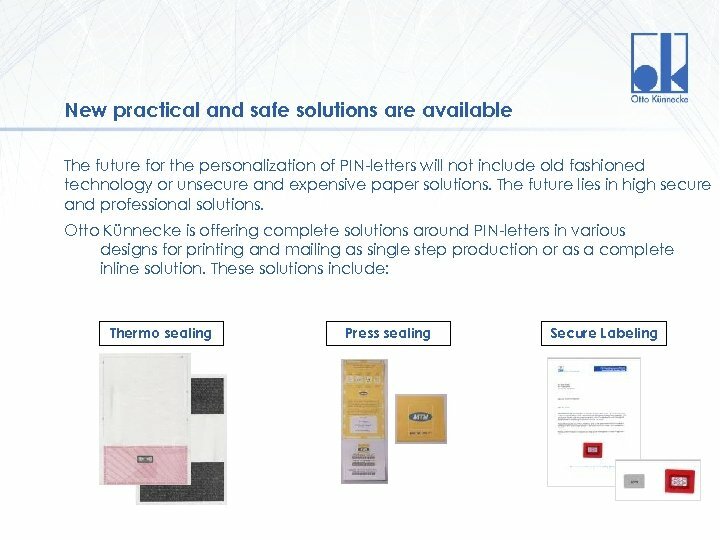 The PIN letter can only be opened by destroying the paper. 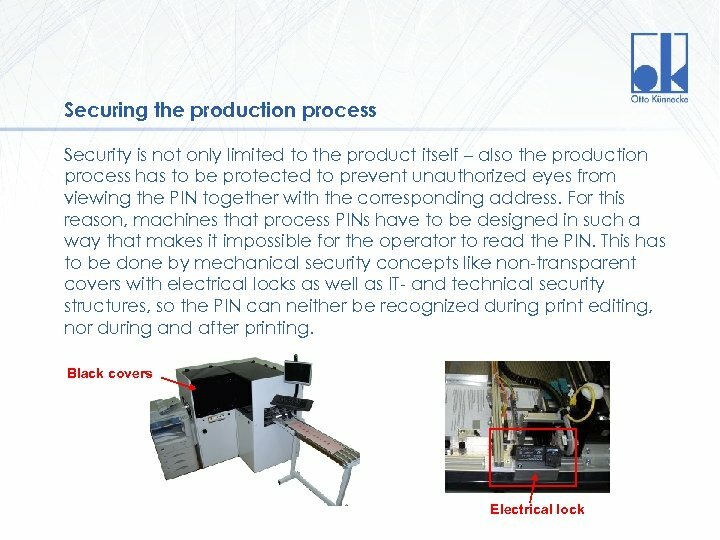 Due to additional security reasons, a special security label can be added to hide the PIN number. The labels which are used are either scratch off or peel off labels. 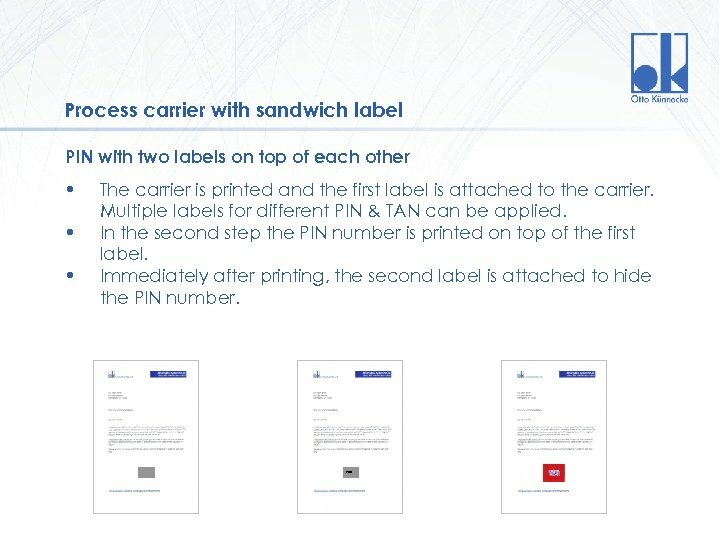 For PIN mailers the gluing process has to be done in two steps to cover all four sides of the paper. 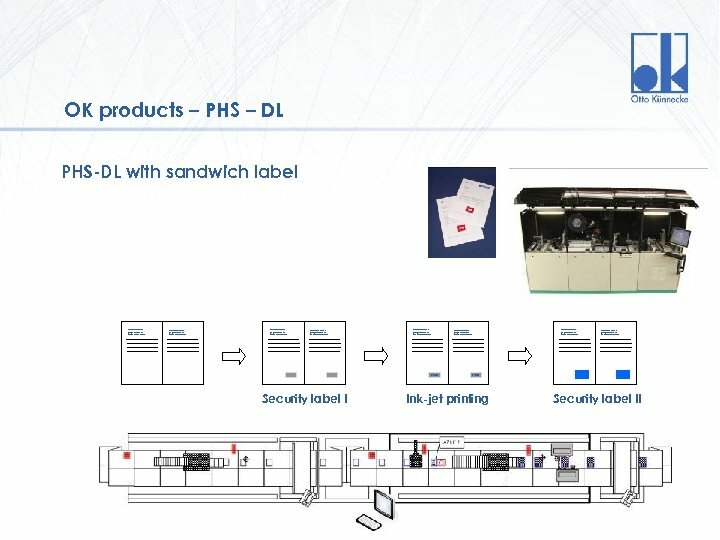 The advantages are obvious • Universally applicable and suitable for laser printers. 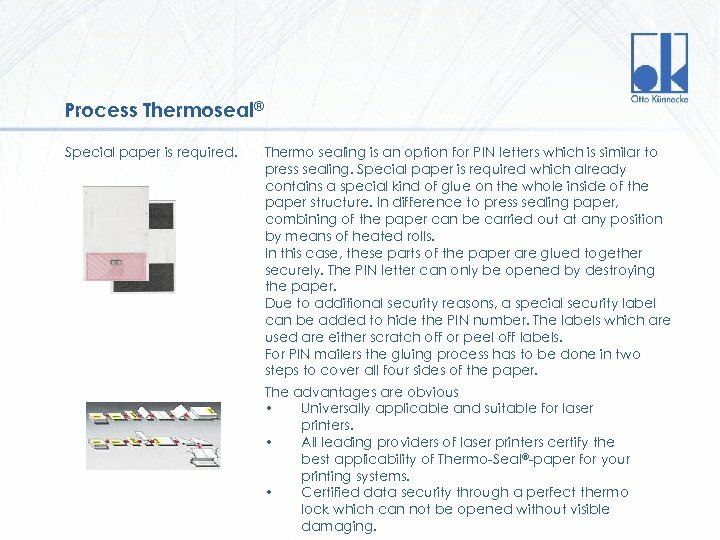 • All leading providers of laser printers certify the best applicability of Thermo-Seal®-paper for your printing systems. 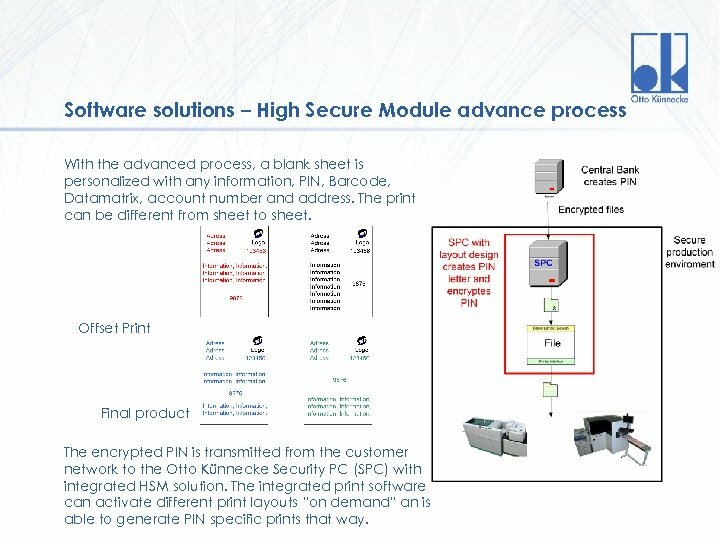 • Certified data security through a perfect thermo lock which can not be opened without visible damaging. 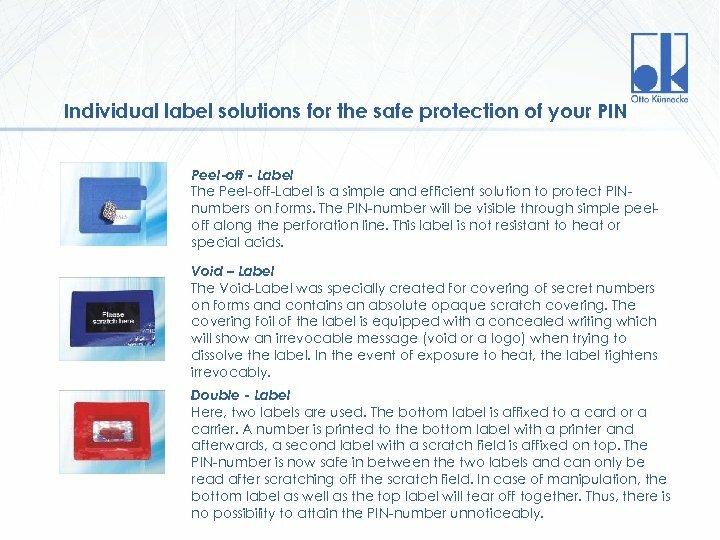 Individual label solutions for the safe protection of your PIN Peel-off - Label The Peel-off-Label is a simple and efficient solution to protect PINnumbers on forms. 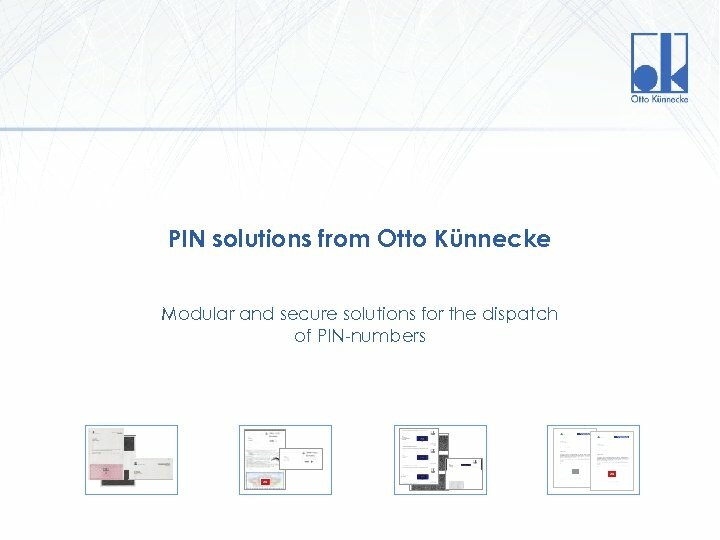 The PIN-number will be visible through simple peeloff along the perforation line. 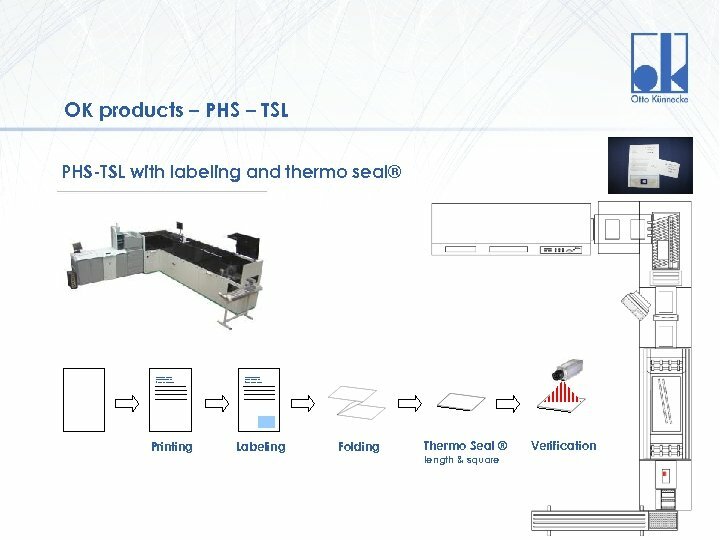 This label is not resistant to heat or special acids. 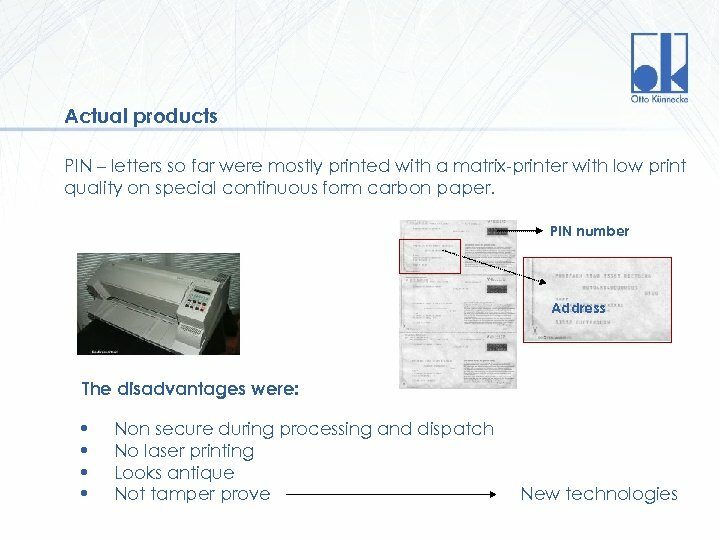 Void – Label The Void-Label was specially created for covering of secret numbers on forms and contains an absolute opaque scratch covering. 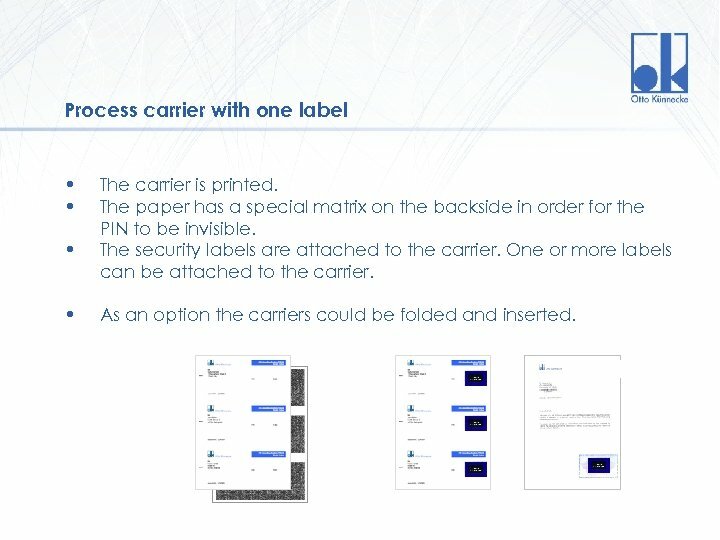 The covering foil of the label is equipped with a concealed writing which will show an irrevocable message (void or a logo) when trying to dissolve the label. In the event of exposure to heat, the label tightens irrevocably. Version 1. 0 Double - Label Here, two labels are used. 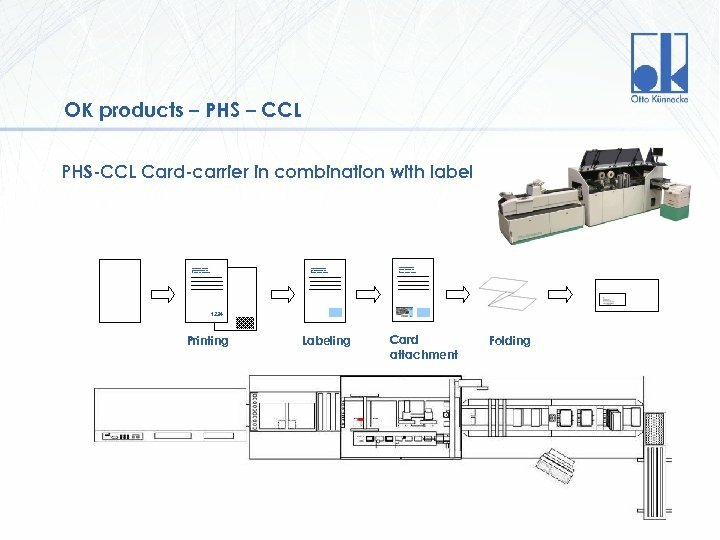 The bottom label is affixed to a card or a carrier. 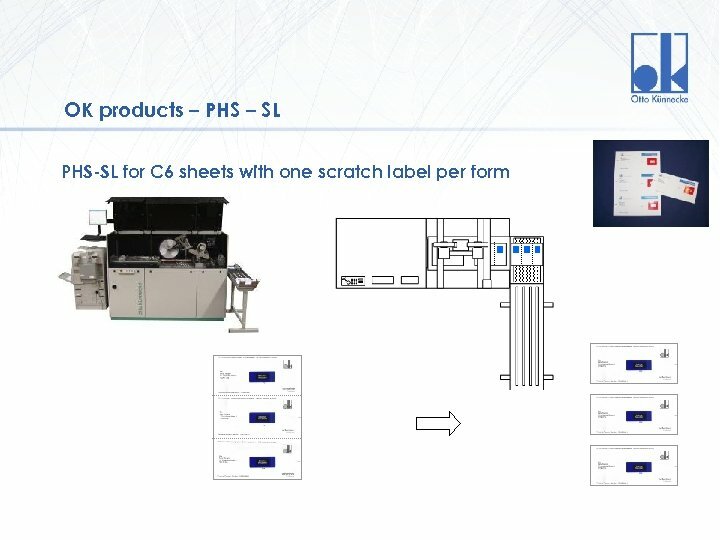 A number is printed to the bottom label with a printer and afterwards, a second label with a scratch field is affixed on top. 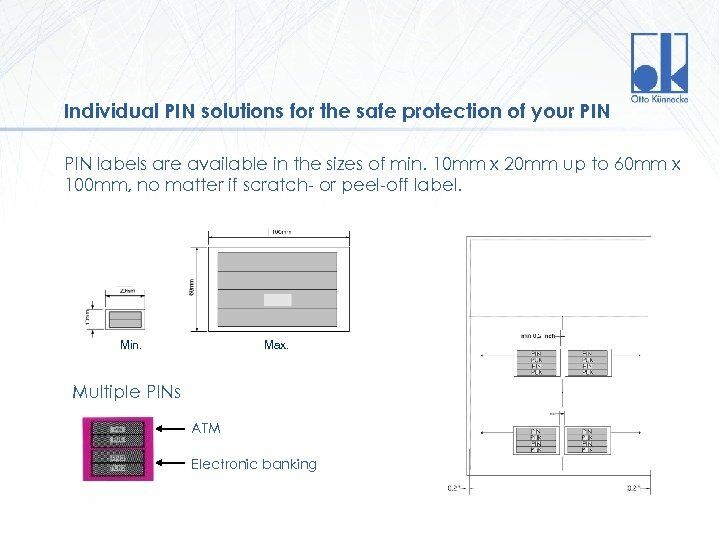 The PIN-number is now safe in between the two labels and can only be read after scratching off the scratch field. In case of manipulation, the bottom label as well as the top label will tear off together. 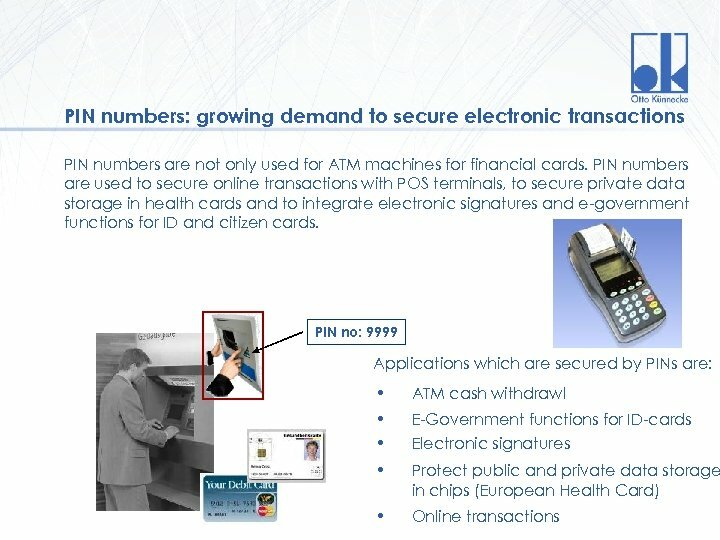 Thus, there is no possibility to attain the PIN-number unnoticeably.